At the bottom of the steps lies the Primula Garden, home to many drumstick and candelabra primulas as well as hostas and paeonies. There are taller plants too. 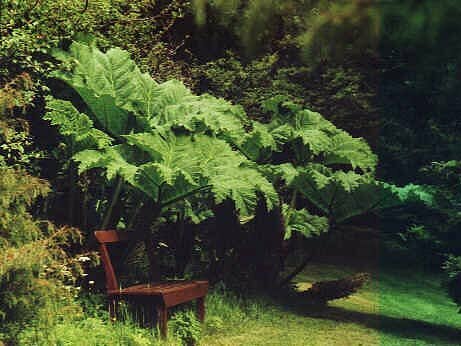 Giant rhubarb (Gunnera manicata), the plant with the largest leaves, adds height and width and there are self-sown Thalictrum aquilegifolium, much crocosmia and a good clump of Euphorbia griffithi. Carolina silverbell (Halesia carolina) is a small tree with good foliage, and striped bark. There are other good shrubs and plants here. Another small tree we like is Corylopsis willmottiae with dainty, pendulous yellow flowers before the leaves in spring. 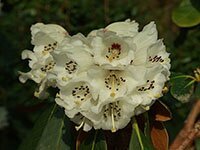 was a present from Mr Macintyre who trained in the Ardtornish Garden in the 1914-18 war. He gave Ardtornish a collection of plants from Ben More Gardens. If you would like to continue your virtual stroll round the garden, walk this way to the pond. To guide you from the lawn to the lower garden are a pair of futuristic-looking gateposts with stainless steel finials. These were made by John Creed. Descend the winding "Grandma's Steps" from the lawn and you will come across a very large terracotta pot with nothing in it though it looks quite good unplanted. Were it less tall, it might double as a litter bin. The steps divide here. To the right, you descend past a hardy old Chusan palm. The left steps take you by the recently cleared and replanted bank which is already beginning to look good. Not everything was cleared and the survivors include Magnolia soulangeana and the purple cut-leaved Japanese maple Acer palmatum dissectum purpureum. Gunnera manicata in the Primula Garden. These enormous leaves need a copious supply of water in summer, rarely a problem here. In autumn, just before they die down, the leaves are cut and mounded on the crowns to protect against frost. By spring, the leaves have decayed to a mulch.